The Democratic super PAC Forward Majority is releasing a seven-figure ad campaign targeting GOP state legislators over their opposition to pre-existing conditions coverage under the Affordable Care Act as part of the group's $8 million investment in over 100 state legislative districts in the 2018 midterm election cycle. Why it matters: This health care topic has shown up in gubernatorial, House and Senate races, where more GOP candidates are campaigning on protecting people with pre-existing conditions, even after their party attempted to repeal and replace the ACA. Now, Forward Majority is trying to help Democrats running for state legislatures in key battlegrounds capitalize on this issue — especially after the Trump administration gave states more leeway last week to waive some of the ACA's rules. The ads will run in Wisconsin, Florida, Texas, Arizona and Pennsylvania, which are crucial states in the midterms. What they're saying: Ben Wexler-Waite, a Forward Majority spokesman, said the Trump admin waiver kicking pre-existing coverage to states "is the greatest political gift Democrats running for state legislatures could have asked for." 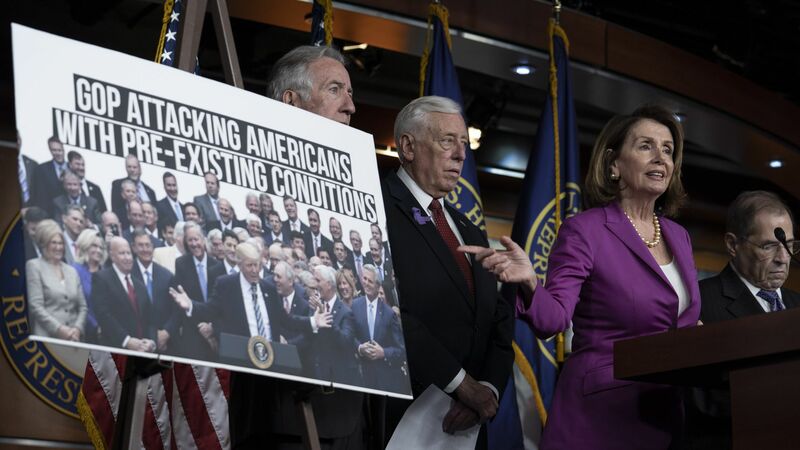 Go deeper: Republicans hit with pre-existing conditions.